Just putting the word out that i recently had this bicycle stolen from me. It's not worth much on the collectors market but has a lot of value to me. If anyone should come across it please help me get it back. It will mean a lot. 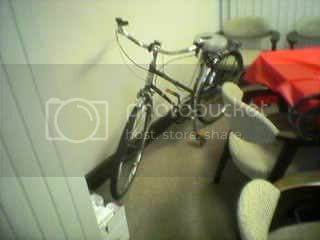 I just had my All Pro 3 speed Kmart Bike stolen. I posted this earlier and some people wanted better pics so here is the best one I can find. The down tube decal says PRO-3and is sliver with blake letters an black and orange ring. The seat tube decal says ALL PRO and is similar style except gold instead of silver. These decals are fadding, as is the headtube decal which is a sheild with blue and red stripe on either side with ALL PRO down the middle in red and the Kmart emblem across the top and has a gold outline. the bike can look brown or dark gold depending on lighting. I really would like to get this back. It disappeared in Ohio zip 44857. Stolen in Norwalk Ohio area. I don't have any intentions of doing anything but getting my bike back. ok so i found a picture of it in the database...it is identical to the 1955 Columbia pictured. Now how do i find out what it is worth? I think this site and CABE are the best resources for the value of your bike. I'd be interested in it if you're in the Northwest. I'm going through a weird old bike phase. I have set of his and hers UNIVAL 5 speed bicycles, Made in Japan. Both are in great condition, super clean, original everything, hardly used. I can't find any info on these bikes and wonder if anyone is familiar with Unival ? Any idea on what they might be worth would also be great.